How smart is strwberesh0rtcke? 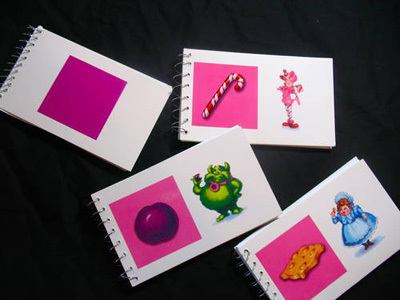 She took some oversized cards from a Candyland game towel she purchased and bound them together to make little recipe books. The bright colors and the size are perfect for holding recipes of your favorite treats. These little books would also be fun just to carry in your purse for jotting down lists and other information that would otherwise get lost. Too cute! To see more photos and to read about this project on Craftster, click here.